The Hollywood Reporter has begun its series of roundtable interviews with awards contenders. They have just posted their Actors Roundtable. 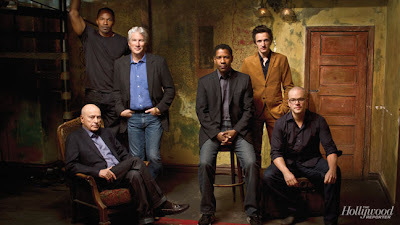 It features actors Alan Arkin (Argo), Jamie Foxx (Django Unchained), Richard Gere (Arbitrage), Denzel Washington (Flight), John Hawkes (The Sessions) and Matt Damon (The Promised Land). They discuss a wide range of topics including politics, fame and life-changing advice. One particularly interesting exchange occurs when they discuss the issue of actresses, particularly those over the age of 40. Denzel Washington's daughter is studying to be an actress and he told her "You're black, you're a woman, and you're dark-skinned at that. So you have to be a triple/quadruple threat. You gotta learn how to act. You gotta learn how to dance, sing, move onstage." He went on to tell her, "Look at Viola Davis. That's who you want to be. Forget about the little pretty girls; if you're relying on that, when you hit 40, you're out the door. You better have some chops." Matt Damon on the other hand has steered his four daughters away from acting. "Women are in a different business than we are. It is just brutal for women. For us, the roles get really good at 40 and beyond. And that's really when you start doing your best work." Previously, they did this Executives Roundtable with Michael Barker of Sony Pictures Classics, Rob Friedman of Lionsgate Motion Picture Group, Jim Gianopulos of Fox Filmed Entertainment, Jeffrey Katzenberg of DreamWorks Animation, Donna Langley of Universal Pictures and Paramount's Rob Moore.